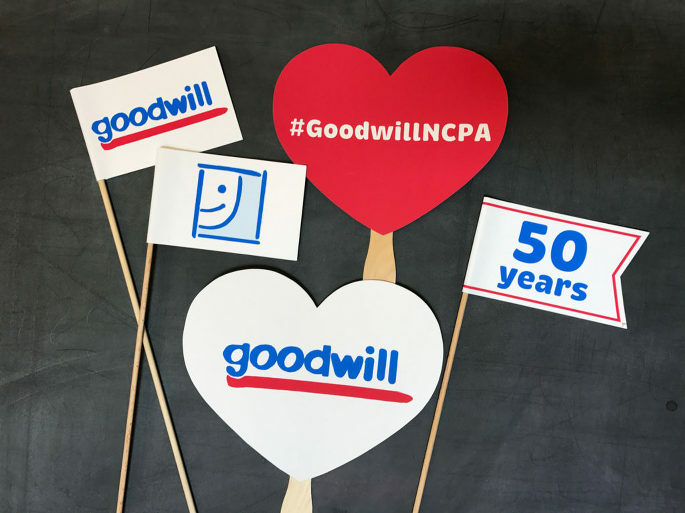 Custom photo booth props – State College, Goodwill, weddings, and more! 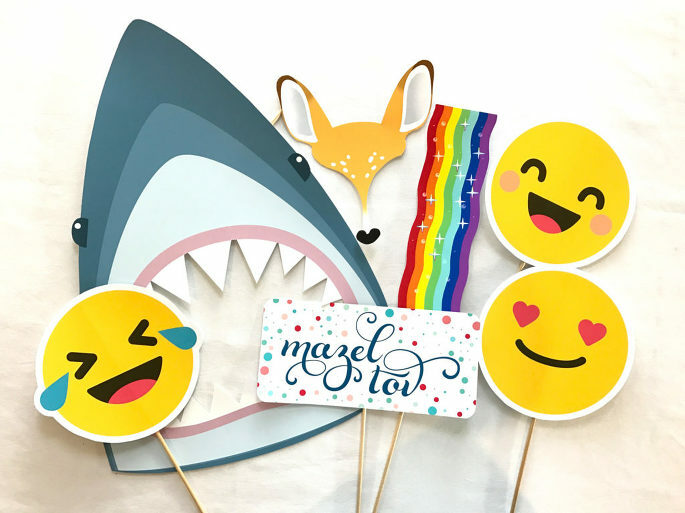 We want all of our events to be special, so we create free custom photo booth props for everyone! Our vast collection of props includes hats, glasses, signs, and more! We’re always looking to add to our collection if you’d like a special theme, but we also create additional props that you can keep at the end of the event. The photos below show a few examples from recent events. We’re in the middle of an awesome wedding season! I wanted to post a quick sneak peek of our new guest book albums. The albums are similar to the old ones but are made in the USA at an old school book bindery. We love supporting small businesses and the people we’ve met at the company are the sweetest. We’re so excited to partner with them to bring our clients heirloom quality albums. Contact us if you’re looking for State College and Central PA photo booth rentals! We’d love to work with you! We went to The National Stationery Show in New York with a few goals in mind: find heirloom albums for our wedding couples, new stationery, and some surprises for our clients. We found what we were looking for and more! We can’t wait to receive our new albums and will post photos when they arrive. They’re similar to our current albums but are handmade in an old-school bookbindery. The colors are gorgeous, the quality is out of this world, and they’re made in America! We know our couples will love them as much as we do. We’re also putting together a little welcome gift for our clients, but that’s still a secret ♥. The Stationery Show is so inspiring and full of amazing artists. It’s hard to put into words what the show is like as a first timer. My mind is still racing and I’m counting the days until next year. I (Alyssa) participated in Tradeshow Bootcamp last year and it was so fun to see the booth designs from fellow alums. They were breathtaking! The first day flew by and we didn’t realize 7 hours passed… 7 hours without sitting/lunch/drinks… I’m not even sure if I blinked! Did I mention I’m crazy for stationery and design? We learned so much, met amazing contacts, and found awesome products. We can’t wait for next year! I have so many photos but here are just a few. Oh So Beautiful Paper shares a ton of photos over several recap posts and is definitely worth checking out (in case you’re a paper nerd like me!). As promised, we wanted to share the new stationery pieces that are part of our brand refresh. We’re nerds for branding so the entire process was pretty fun! We wanted something simple and clean so these are a perfect match! We want our process to feel special for our clients and this is just another tiny detail. In addition to loving branding, I’m (Alyssa) crazy for stationery! We’re heading to the National Stationery Show in New York next week to look for complementing items and the perfect gifts and surprises for our clients. Follow along on Instagram to see photos from the show. We’re so excited! We’ll be sure to post a recap here next week. We’re so excited to announce the launch of our new website and brand refresh! For the past several months we’ve been working with the amazing ladies of With Grace and Gold to refine our brand and build a website that truly shows what we have to offer. They built a few fun surprises into the website and we hope you love them as much as we do. Our previous site was seven years old. SEVEN YEARS! We hope our new website will better explain what we do and get you excited about photo booths! 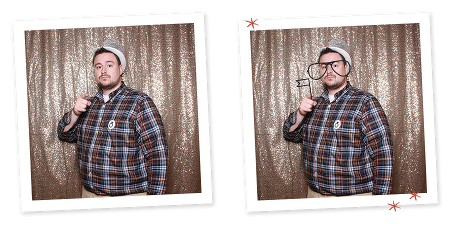 If you haven’t seen us at an event, you should know that we LOVE photo booths! We still meet people at events who have never seen a photo booth in that type of setting. How cool is that? We are passionate about great service, design, and high quality photos with gorgeous lighting. We care so much about your event and want it to be awesome. We customize each experience just for you and that starts with the best logos and props… we create special ones for each event! Take a look around, we’d love to hear what you think! We need to thank Kelly and Andra for their awesome work on the new website! We are grateful for their patience and the love they put into their work. We are super excited about everything they’ve done! We also need to thank Sadie of The Little House Studio for her help with the styled photos on our site. We couldn’t have done this without her! We can’t forget Pie Collective and the crazy super cute video they made for us! We love it so much! We thought it would be fun to show you our brand inspiration board that helped jumpstart the design of the new site. Next week we’ll show you our new stationery pieces. WINK! is Brandon and Alyssa, two Penn State alums living in State College, PA. With a love of vintage photo booths we wanted to expand the local wedding industry and created Central PA’s first photo booth rental company. We design and rent photo booths for events like weddings, birthday parties, fundraisers, tailgates, graduation parties, proms, Penn State club events, corporate events, bat/bar mitzvahs, and more.